A combination of both writing and speaking is necessary for you to communicate well. 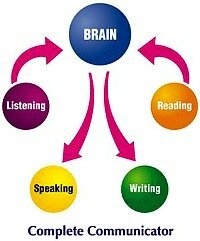 To achieve this, first you need to acquire good reading and listening skills. What happens if you master one without the other? To learn English grammar and familiarise yourself with the system and its rules. Why? To relate this grammatical system to the content of your message. Why? It sounds a bit dry, but you can have a lot of fun, if you can practice your communication skills with friends. Join My English Club and find friends who are doing the same. Don't be shy, use the form below.